The Girders of Hell - Stonewashed Steel Bars and Skulls / Leather Cord Bracelet | BUDK.com - Knives & Swords At The Lowest Prices! 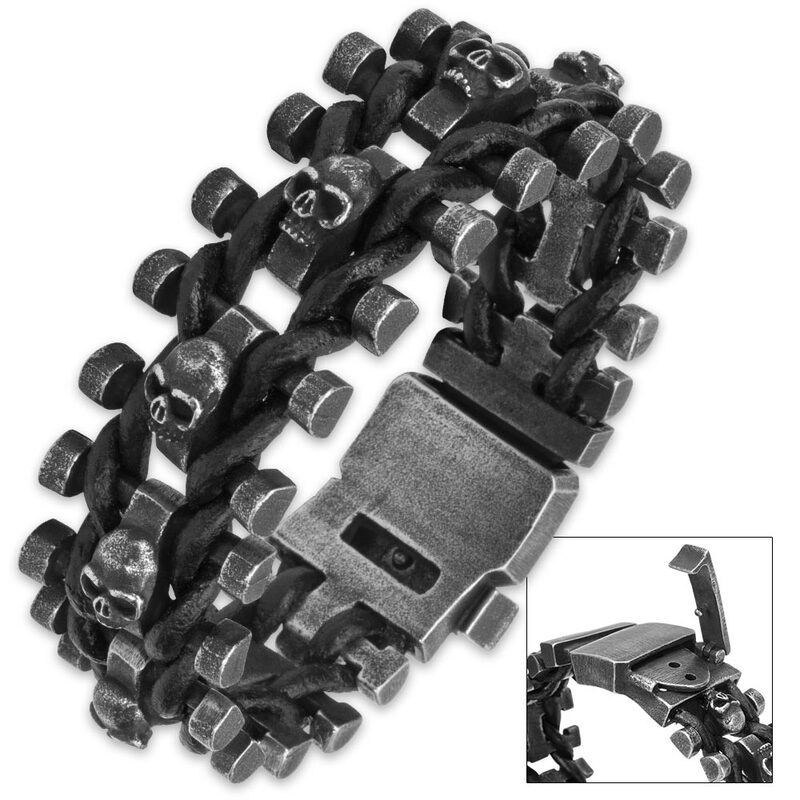 Delightfully ghoulish and dripping with in-your-face macabre style, the "Girders of Hell" bracelet is perfect for bikers, goths, rock stars (legitimate and wannabes alike) and anyone whose fashion sense leans toward the dark side. A series of matte gray stonewashed steel skulls and bars support intertwined black leather cords in this this awesome, unapologetically sinister accessory. Each skull features embellished eye sockets, yielding an angry, menacing expression that impeccably complements the bracelet's overarching "bleak-chic" motif. "The Girders of Hell" looks equally amazing on men and women and pairs well with practically any outfit. Its high quality leather and stonewashed stainless steel construction boasts corrosion resistance and durability that simply can't be matched by more traditional - and, not to mention, expensive - jewelry materials. Precious metals like silver and gold tarnish and scratch, and even advanced modern ceramics are prone to chipping. But the Girders of Hell Bracelet is carefully crafted for a lifetime of vigorous wear. 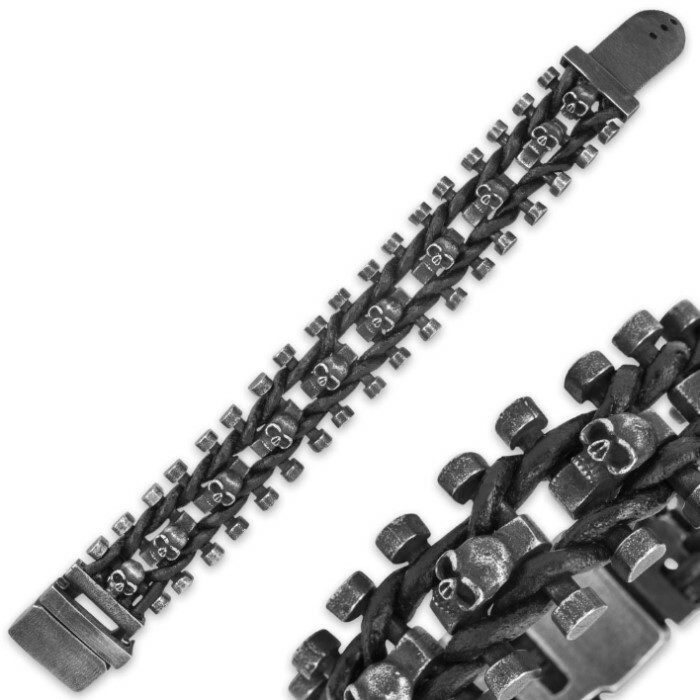 At 9 1/2" overall, it easily fits most arms, especially with the convenient steel buckle clasp. The Girders of Hell Stonewashed Steel and Leather Bracelet makes a fantastic, memorable gift, and you won’t find better prices on fine jewelry like this anywhere else!